It’s hard to believe I was diagnosed with multiple sclerosis 10 years ago. To mark this milestone, I decided to write a letter to that terrified woman (me) in the doctor's office who's just been told "You have MS"
I just heard you’ve been diagnosed with MS. I’m so sorry. I’ve been there. I remember sitting in the doctor’s office, in shock, trying to listen to the neurologist go over MRIs and the results of that horrible spinal tap. He’ll give you some steroids and a prescription for injections, even though you hate needles. Your boyfriend is picking you up because you can’t drive due to the numbness in your feet. You’re crying and thinking he’s not going to stick around because of this MS thing you’ve just been told you have. And the career you’ve worked so hard for here in New York City? That’s probably not going to work out either. But after many days feeling sorry for yourself, you’ll remember someone you work with, Neil Cavuto. He has MS and seems to be doing well despite the illness. He’s the senior vice president, managing editor and anchor for both FOX News Channel and FOX Business Network, and he’s just an elevator ride away from your office. You’ll call him, and he’ll tell you to come in to talk, even though most of what you’ll do is cry while he hands you tissues. Neil will tell you that you’re going to be OK, and you will grow stronger in ways you never imagined. And then you’ll start to feel a little better. You’ll see a glimmer of sunshine coming through those dark clouds. Janice, I’m now going to tell you what happens to you 10 years later. Your boyfriend who’s picking you up at the doctor’s office? He’ll be your husband. He’ll tell you he’s not afraid of MS, and those are words you will remember for the rest of your life, along with that wonderful question: Will you marry me? Your career will continue to grow, and it will give you great confidence. You will not be judged by your illness, and your peers will treat you with kindness and respect. Perhaps the biggest news I can give you is that you are going to give birth to two beautiful boys, and they will bring you more happiness than you can imagine. You will have a family that loves and supports you, no matter what the future holds. Janice, I write this letter so that you know there’s hope. You just can't believe how rewarding and full of joy your life will be. 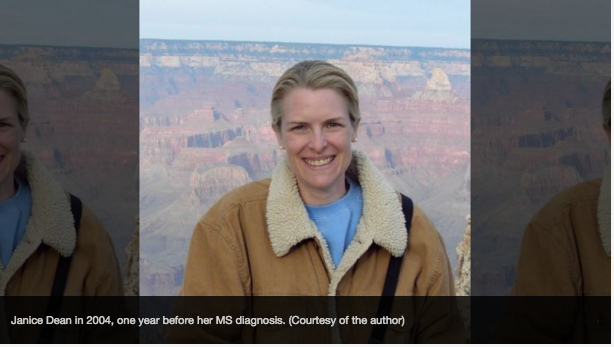 Yes, you will be reminded that you have MS more often than you’d like, and you'll find out that it can be a tricky disease that strikes when you least expect it. But there is tremendous hope on the horizon now, with more therapies and scientific research being done. There will be a cure someday. But until then, keep meeting others who have been diagnosed and hope that by sharing your story, people won’t feel alone in their journey. Ten years ago you think your life is over. Truthfully, that day you were told you had MS may have been the moment you really began to live.